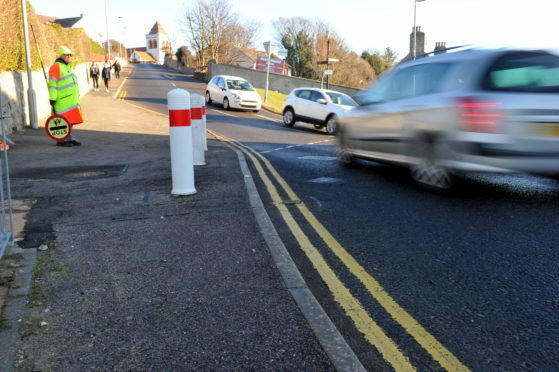 Safety concerns have been raised about the School Brae junction. Serious concerns had been raised about the speed of traffic at the foot of School Brae in Lossiemouth. The junction is popular with students walking to the town’s high school as well as Hythehill and St Gerardine’s primary schools. Yesterday, the council’s economic development and infrastructure committee backed a £120,000 plan to pay for traffic lights and pedestrian crossings. Council staff will now prepare a bid to Transport Scotland to cover the costs for the project, which has been spearheaded by Lossiemouth Community Council, with cash from charity Sustrans. Heldon and Laich councillors John Cowe and Ryan Edwards both backed the proposals at yesterday’s meeting.